1 Who needs a bivy sack or tent? 1.2 Why get a bivy? 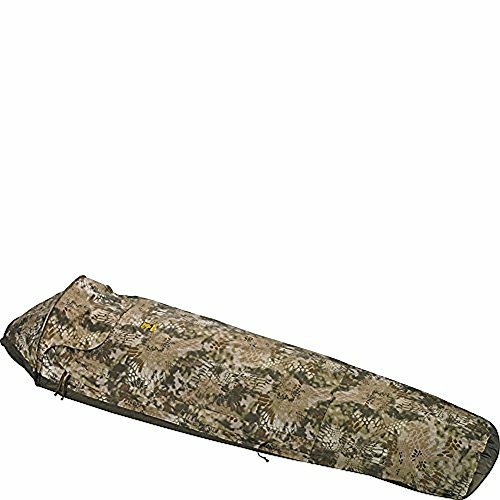 2 What is the best bivy sack? 11.1 What is a bivy sack and why is it used? 11.2 Bivy sack vs tent. Which one works better? 11.3 Bivy sack vs hammock- which one is better? 11.4 Bivy sack & tarp – does it make sense? 11.5 Bivy sack vs sleeping bag / Do you need a sleeping bag with a bivy? 11.7 Can you use the bivouac sack in the rain? 11.8 Should you use a bivy sack when hunting? 11.9 Bivy sack condensation- can you work around it? 11.10 Bivy sacks and the risk of suffocation! 11.11 What are the most common bivy sack materials? 11.14 4 season Bivy tent – what’s to know? 11.15 Emergency bivy sack- why should you get it? 11.16 The insulated bivy sack – is this an oxymoron? 11.17 Can you use a bivy sack inside a tent? Who needs a bivy sack or tent? Does solo trips in the backcountry. Does long big-wall climbs that can’t be covered in a day. Takes long biking trips and needs a light shelter to camp at night. Is a die-hard minimalist who’s trying to eliminate every possible ounce off their loads. Goes winter camping in snow caves. The bottom layer is made from a stronger waterproofed nylon fabric whose function is to insulate from the damp or wet ground. The top layer is made of a ripstop nylon coated with a breathable laminate such as GoreTex. Its role is form a waterproof barrier but at the same time to allow inside vapors to pass through to the outside. The main reason – besides lightening up your load – to get a bivy bag/tent is insulation and waterproofing in extreme weather conditions. These days you can get a one or two-person tent that weighs as much as a bivy tent but gives you a lot more space for you and your gear, as well as it does not have the condensation issues of a bivy, nor does it make you feel claustrophobic. In warm weather it makes more sense to carry a tent. A bivy however is better suited in colder and/or more humid conditions, since it will give you a few extra degrees inside, and better waterproofing. Condensation. You will get condensation in any bivy tent, so make sure to use a sleeping bag with a waterproof outer shell, to keep the bag dry. Sleeping bags can get seriously wet from condensation, especially on longer trips where the bag can’t get dry from one night to the next. In rainy weather, the bivy’s outer membrane stops being breathable which results in yet more condensation buildup. Condensation will only keep accumulating in prolonged rain, and in such conditions it becomes vital that you have a waterproof sleeping bag to keep you dry and warm. To prevent condensation, choose a bivy that has good ventilation, preferably with vents at the head and other(s) at the feet. Waterproofing. A good bivy will have no problem keeping moisture away. 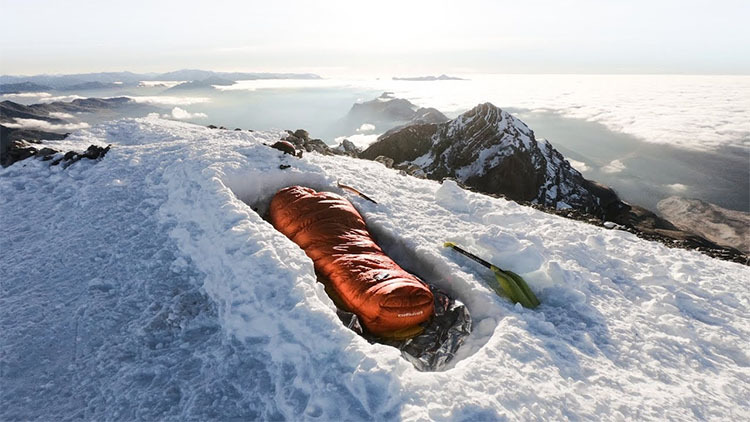 However, water puddles or snow may accumulate on top of the bivy especially around the feet area and actually press down to lean against your body. If your sleeping bag is thin, you will get cold. That’s why it’s a good idea to hang a tarp sheet over the bivy that would cover both you and your other gear. It will keep heavy rain and hail from hammering you, and will let you get out of the bivy easier in bad weather. See the full bivy tent buying guide. The best bivy sack is the one that fits your needs and type of outdoor experience the best way. It should be able to keep the elements away from your body, but it shouldn’t have a high risk for condensation. It should also be able to take up a beat and save you in a nick of time. 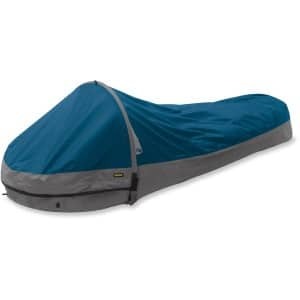 Of course, you shouldn’t blame it for an unpleasant camping experience as where you install it, what kind of sleeping bag you’re using and so many other things count for its overall performance. Waterproof and breathable, the Outdoor Research Molecule Bivy Long Bag is yet another model from Outdoor Research that doesn’t disappoint. The build and its features recommend it for the use even when the weather isn’t the best. The bivy sack is going to keep you dry and warm as it’s made with waterproof materials. It’s fully seam-taped so you’re going to remain dry even on a rainy day. It features a No-See-Um mesh is going to protect you against the insects and hydroseal floor helps you stay dry. The Anti-Fungal coating on the floor is going to reduce the risk for bacteria to grow. 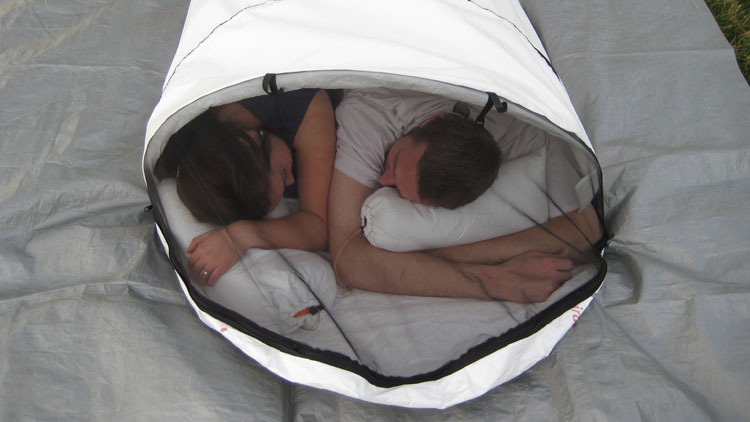 The one-person shelter comes with overlapping zipper so it’s easy for one to breathe inside. The foot box is vented, which helps for the moisture to escape. The bivy sack is easy to use by both left and right handed people. You don’t need any poles for setting it up. It’s well made and has a sturdy feel to it, being ready to take the use for a good amount of time. Regardless of the minor problems, kudos to Outdoor Search for designing another great model of bivy sacks that doesn’t disappoint the experienced survivalist. When you’re looking for a bivy sack that helps you hide into the surroundings, the Slumberjack Contour Bivy is one option not to miss. 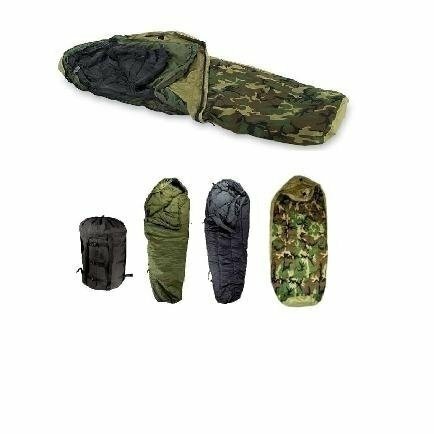 The camouflage pattern is just one thing to begin with, as the bivy sack comes with many good features. It comes with dual zippers with hook-and-loop tabs, ensuring “arms out” functionality. It features a visible visor that you may easily flip open for using the bug-free mesh window. This is going to improve the ventilation inside the bivy sack. The bivy sack is pretty comfortable as it has a hooded design and 4 zipper sliders that increase the ventilation and offer easy access. The seams are waterproof taped and the bivy sack has 40D waterproof/breathable upper fabric for better protection against the elements. Its bottom is made with 70D Polyester Taffeta and has 2000mm coating that protects against moisture. Fire retardant and lightweight, the bivy sack comes with a stuff sack and is well made. It goes without saying that the bivy sack is going to ensure a good performance on many levels and its minor flaws are, in fact, easy to overcome. When a bivy sack is too much or, by contrary, not enough for your needs, maybe you should give it a try with a bivy shelter instead. Take the plunge with the SnugPak 92860 Stratosphere One Person Bivy Shelter and see how liberating, protective and comfortable this type of shelter can be. The bivy shelter is well engineered and its setup is a lot easier than one may think. It comes with lightweight poles which are going to create a canopy support around your shoulders and head. This is great especially for one dealing with claustrophobia (the main cause for not using a bivy sack instead). Even if the poles are lightweight, they’re sturdy and come with screw lock tips so that the shelter stands up to challenging weather. 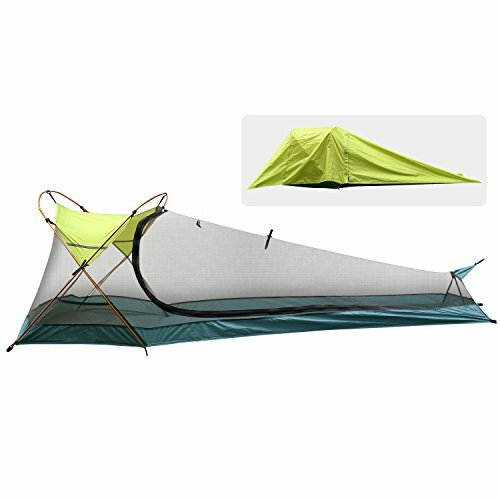 The 1 person bivy shelter presents good breathability and protection and comes with roll away mosquito net. The full length side zip provides easy in/out access. All seams are taped sealed, which helps with the waterproofness of the bivy shelter. 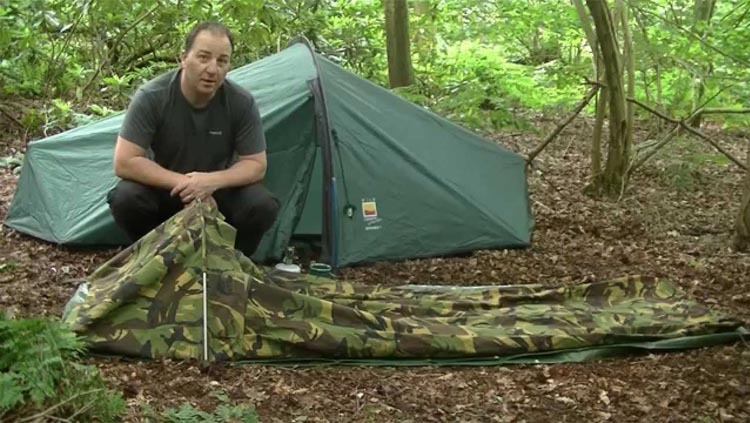 The bivy shelter is rather lightweight and packs really compact and small. It’s lighter than a typical tent and easier to install as well. 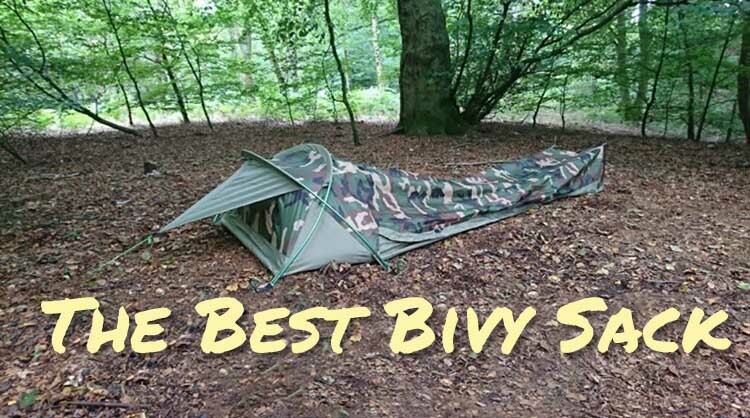 Lightweight, dependable, easy to use and to carry, the bivy shelter is a great option for one that likes the bivy type of shelter, but fancies the bivy shelter type a bit more. The more you’re willing to pay for your bivy sack, the more you should expect in terms of performance, durability and features. The Outdoor Research Alpine Bivy is going to throw off some with its price tag, but it’s not going to disappoint the true survivalists out there. Made with waterproof Gore-Tex, the bivy sack is highly breathable and fully-seamed taped. It features a No-See-Um Mesh (which is removable), hydroseal floor and anti-fungal coating on floor. It has a one-pole design and comes with sleeping pad straps, one guy line loop and five stake loops. You’re going to find the internal mesh pocket great for storing some of your essentials, whereas the toe-end has high volume and wide storm flap. As a matter of fact, the bivy sack is quite spacious and really comfortable. The bivy sack is going to keep you nice and warm and the risk for condensation is really low. Everything about its build, design and features says high quality and the bivy sack has a durability feel to it. Lightweight and compact, the bivy sack is going to protect you even in a storm and it’s worth every single penny. Nevertheless, as it’s protective, reliable, tough and durable, the bivy sack is a wise investment of your money any given day. Lightweight, compact and waterproof, the Aqua Quest Hooped Bivy Tent has just the right price considering the performance and overall value. This bivy sack is made with 70D Ripstop fabric and has laminated PU coating. Its heat taped seam are an important detail which explain the waterproof of the bivy sack. Packing down incredibly small, the bivy sack is ultralight and compact so carrying it while hiking is never going to be uncomfortable. Versatility is another part that the bivy sack is able to check. It’s wide and long and the zippers on both sides ease up the access and the use for both left and right zippered sleeping bags. You may use the bivy sack on its own, or inside of another type of shelter (tent or under a tarp, for instance). Water tight, the bivy sack comes in a carrying sack and it’s really easy to set it up. It’s well made and protects you from the elements. And it does all of that for a little over $50. A penny saved is a penny served and this bivy sack is going to be a great addition to your camping equipment, especially considering its price. If you’re looking for a bivy tent that doesn’t empty your pockets, the Rhino Valley Bivy Tent, Waterproof Portable Lightweight Bivy Sack should be on your shopping list for camping. The design and construction of the bivy tent are truly impressive and this one is made with embossed cloth and high density gauze net cover. It keeps the insects at bat and provide good breathability too. The bivy tent is made with waterproof materials and doesn’t get you all wet. You may easily use it on a sunny day for shade. The aluminum poles are lightweight and the bras buckle gives stability to the bivy tent. You also get tent peg and tent ropes for more stability. The D shape open mouth and two-way zipper are nice features for more functionality. It provides nice room for the head and it’s really comfortable. Putting it together and taking it down is rather easy. The bivy tent comes in a bag, storing it compact. It’s easy to carry it around. Regardless of the minor issues, for the functionality, lightweight and reliability in many situation, this bivy tent is one choice to keep in mind when you want to switch from a regular bivy sack to a bivy tent. 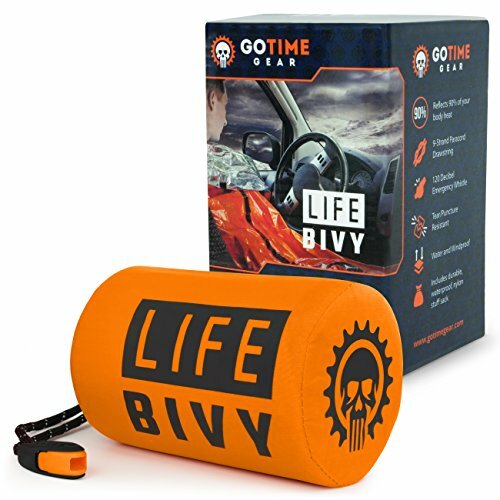 Great to save you in case of an emergency, the Go Time Gear Life Bivy Emergency Sleeping Bag Thermal Bivvy isn’t just easy to pack, but also a life-savior at times. 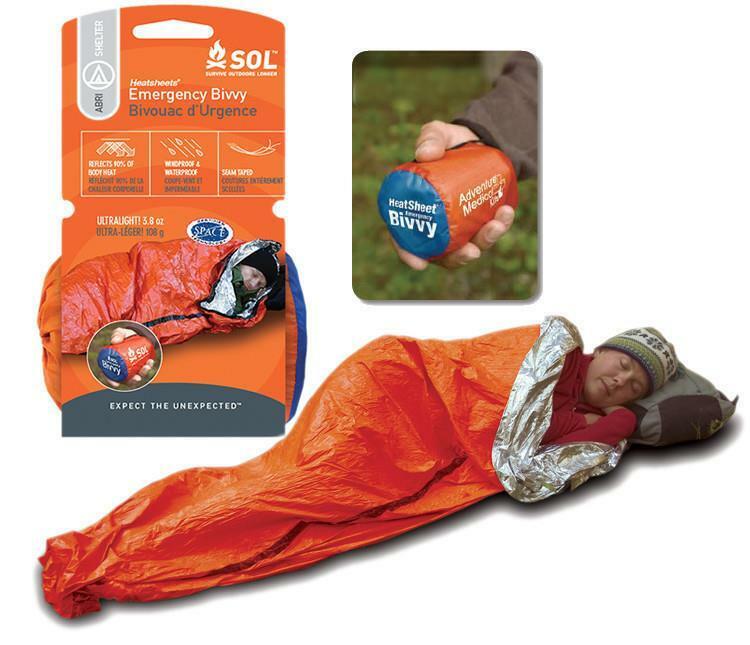 The bivy emergency sack is going to work as an emergency blanket, survival shelter and an emergency sack altogether. It’s made especially for the emergencies and you should put it in your BOB, survival gear or even your car survival kit. The bivy sack comes with patent pending para-synch technology paracord drawstring and survival whistle. You may use the drawstring for securing your gear, start a fire or build an emergency shelter. Made with thick and puncture resistant material, the bivy sack is ultra-lightweight and it’s going to take the extreme conditions. It handles the intense use and it’s really easy to fold up and placed right back inside its waterproof Nylon stuff sack. The bivy sack is waterproof and windproof and the sealed seams are going to protect you even more. It comes with reflective interior, keeping your body warm and reflecting 90% of your body heat right back at you. On tops of everything, the bivy sack comes in a bright orange color so you’re going to be easy to spot on by your rescuers. Beggars cannot be choosers and the bivy sack isn’t just affordable, but also reliable for emergencies. Why not take the plunge? If there’s only one word that you’d use to describe the Outdoor Research Helium Bivy, “ultra lightweight” is definitely going to be it. But being extremely lightweight isn’t the only quality of this bivy sack and there are many good things to say about it. The bivy sack is made with waterproof and highly breathable material and it’s going to keep you nice and dry through many storms. The construction is dependable and the bivy sack is fully seamed-taped and has a durability feel to it. It features a hydroseal floor and a No-See-Um Mesh. The list of good features continues with the One Guy line loop, the internal mesh pocket, the sleeping pad straps and the five stake loops. 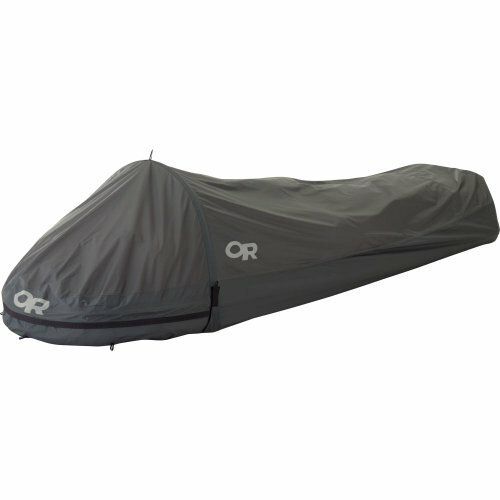 The Delrin Single-Pole system increases your comfort and the bivy sack is comfortable altogether. It’s a great option when multi-day backpacking and the risk for condensation is rather low. Able to get you just fine through thick and thin, the bivy sack isn’t just a reliable choice for a multi-day backpacking trip, but also one of the lightest option altogether. 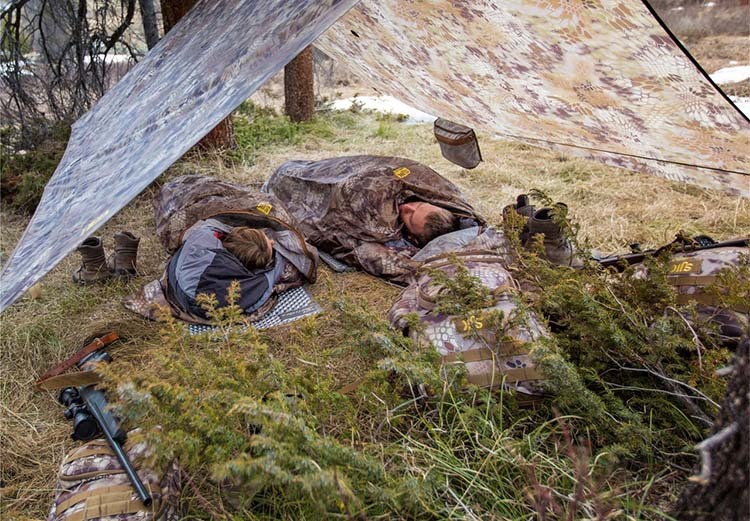 Even if the Genuine U.S. Military Goretex 5-Piece Improved Modular Sleeping Bag System is made for military use and it’s a component of the Military Modular Sleep System, you can definitely use it for your hunting adventures. Made with Gore-Tex, the bivy sack is waterproof so it’s going to keep you nice and dry on rainy days. It comes with Woodland camouflage so your game isn’t going to notice you that fast. The material isn’t just waterproof, but also moisture-vapor-permeable, leading to less risk for condensation. All of the seams are heat sealed so you shouldn’t worry about its ability to help you stay nice and dry in the rain or snow. You shouldn’t worry about your level of comfort either as the bivy sack is really spacious and you can easily fit in your sleeping bag. Adding 5-10 degree to your body’s temperature, the bivy sack is a great addition for any hunter or military. It has low crinkle sound and everything about its build is solid and long lasting. On top of all of this, the bivy sack is easy to compress and get into its stuff sack when you’re done with it. However, if you’re a dedicated hunter, this bivy sack is going to be a staple in your hunting arsenal and you should take the leap of faith with it. 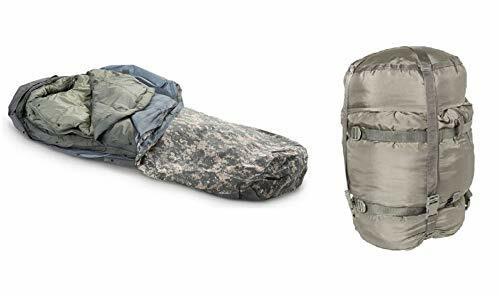 The US Military Genuine Issue Complete Modular Sleeping Bag System is an all-season sleeping bag system that includes 4 pieces. It’s replacing the old black and green bag with woodland bivy cover. The system is made with Gore-Tex fabrics so it’s going to keep you dry and comfortable during extreme weather conditions. The fabric is going to let the respiration and moisture escape away from the inside, but it’s not going to sacrifice on the insulation for your comfort. The material allows oxygen and carbon dioxide circulate through it, so you can enjoy sitting in it. The bivy sack is going to take rain, snow and wind as the Gore-Tex is going to maintain you dry and comfortable. The fabric is long lasting and takes the heavy-duty use for a long time. Thanks to the one-of-a-kind Fastpack technology, the 3-SSS bivy bag is really lightweight (less than 2pounds) and packs compact and easy. The stuff sack isn’t just waterproof, but also rugged and durable. It’s a solid sack which stores your gear dry at all times. The risk for condensation is minor as the system presents highly breathable moisture vapor transmission (MVTR) abilities. We also need to highlight the gas diffusion abilities which enable full enclosure. The design is great and the bivy comes with a mesh hood (an improvement from the previous model). You may zip open the head of the bivy for using the black mesh bug net. It has wires so you may bend it to the shape of your face. You need to slip into the bad from the top –some think that this is a downside. If you’re trying to get in and out really fast, it may be a bit difficult. Dependable, waterproof and taking the military use for a long time, the USMC bivy sack is a wise investment of your money any given day. Great for making you difficult to spot into surroundings, the ACU Digital Bivy Cover is going to be a reliable bivy sack for many situations. It’s not only the digital camouflage that you’re going to like, but also its material and build. The bivy sack is made with 100$ water/wind proof outer layer and it’s a solid choice for enclosing patrol. You can easily fit in your sleeping bag and use it as a complete modular sleep system. 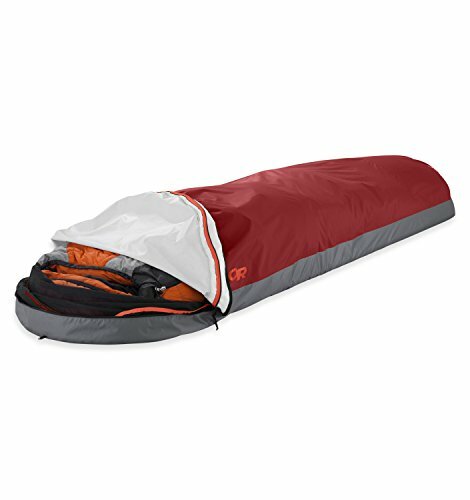 The design is well thought out and the bivy sack comes with 2-way nylon zipper that works very well and helps for top and bottom ventilation. The zippers are non-locking sliders that don’t jam, snag and are self-repairing. The bevy sack packs really small and it’s lightweight. It’s strong and highly breathable and the risk for condensation is minor. It’s not bulky at all and makes a great choice for any terrain. Even if the bivy sack isn’t all roses and rainbows, you should still take a leap of faith and get it as it’s going to work just fine for many outdoor situations. Any dedicated hiker or camper already knows by now that having the right gear when out there can make the difference between a good and a bad experience. Should you ever find yourself in an unfortunate situation, wearing the right clothes, having on you some waterproof matches can literally save your life. From all the things you need to buy wisely for your outdoor experience, the bivy sack is just one piece of equipment that requires your attention. Scroll down for everything there is to know about it and more. What is a bivy sack and why is it used? 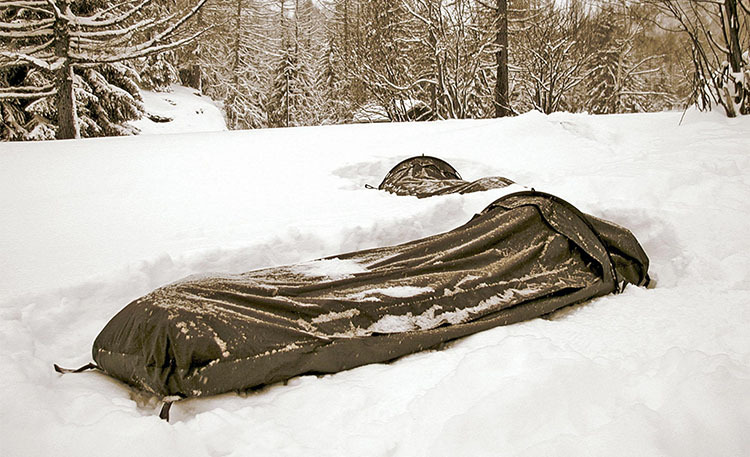 Also known as the bivouac sack, the bivy sack is in fact a personal-sized waterproof shelter. When you don’t need nor willing to pack a tent, the bivy sack is going to work for sheltering as it’s smaller and lighter than a regular tent. The climbers were the first ones to use the bivy sack on the multi-day trips, but it has become a regular choice for minimalist campers, hikers and mountaineers. Most are using the bivy sack for adding only a thin, but waterproof fabric over the sleeping bag. This is going to provide better protection throughout the night. The bivy sack ensures efficient insulation and helps you not to get wind chill or rain. A basic bivy sack comes with an opening for your eyes and for breathing. However, newer models are made with materials that are waterproof and breathable at the same time (Gore-Tex), so you may very well close them without leaving an opening. This is going to keep you protected from the elements entirely. Bivy sack vs tent. Which one works better? Any outdoorsy person knows that both bivy sacks and tents make efficient shelters, but they help you in different ways. If you cannot decide which one you have to get for the next hiking trip, here’s a closer look at each of them. When it comes to weight, the difference is pretty impressive between the two types of shelter. Bivy sacks are both simple and lightweight and you don’t need any tent stakes or any other elements to put together when you set them up. Bivy sacks are also smaller so packing them in your backpack isn’t going to be a problem 99% of the times. this doesn’t happen to the tents that are heavier and take more space for storage. As a matter of fact, tents are almost twice the weight of a bivy sack, most of the time. One of the main benefits of bivy sacks is that you can sleep anywhere in them. You don’t need to look for a good spot for using them. This isn’t going to do it for the tents as they need a camping spot that is large enough for installation. you also need to take a good look at the installation spot as it has to accommodate the structure of your tent. When you don’t know much the place that you’re going to see, you should get a bivy sack along with your tent. As they need little to no effort for installation, the bivy sacks are a great option when you’re going to some challenging spots as well. One thing to keep in mind is that a bivy sack isn’t going to be able to fit all of your equipment into it- as opposed to a tent. Some items cannot be placed into your bivy sack at all as they may remain unprotected from the elements. Another thing related to the use is that you need to try your bivy sack for a couple of days, which is going to be tricky when you’re camping for more than just one day. Most bivy sacks out there are rather small so they’re not going to offer much space for movement. They provide pretty limited space and the risk for condensation is really high too. Using a bivy sack when wet is really unpleasant. The dampness problem may be solved if you’re getting a breathable sack right from the sack (you’re going to have to pay the extra buck for this type) or use synthetic sacks. Another solution is to apply hydrophobic treatment that is going to reduce the wetness on your bivy sack. When it comes to comfort, it’s obviously that a tent is going to ensure a lot more space. Some are big enough so that you may move around and fit all of your equipment in it too. This is why tents are more comfortable than the bivy sacks, most of the time. When you’re camping on your own, you may not even need a tent (but this doesn’t mean that you cannot find tents that are great and easy to pack for just one person). If you’re going to hike/camp together with your friends, it’s more than obvious that one bivy sack isn’t going to be enough. No matter their size, bivy sacks are designed for just one person. When you’re travelling with a group, the tent is always going to be the better choice. The type of your trip sure counts when choosing between several bivy sacks or several tents (or just one huge tent for all of you). It all depends on the number of people and the relationship you have with them when deciding on the size of the tent. Even though they’re more simple than the tents, bivy sacks are actually more expensive than them. The diversity of tents is impressive and many good models are going to start from $100. The more features your bivy sack or tent has, the more you’re going to pay for one. 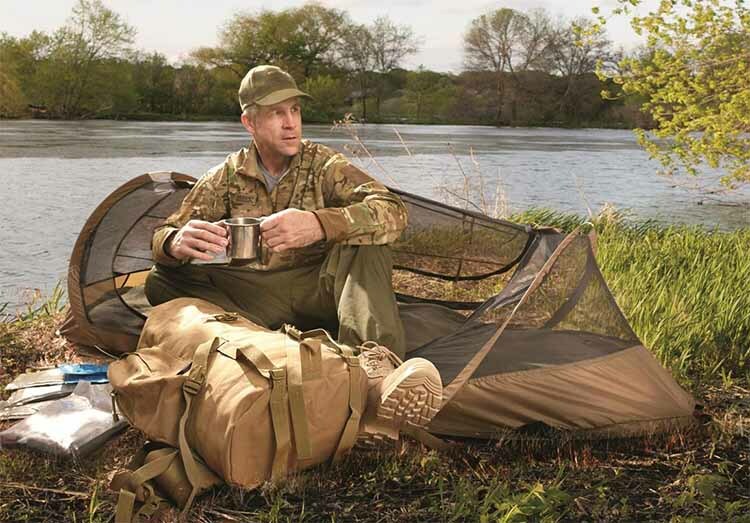 Some expensive bivy sacks come with a net, but the same is true for the tents. Some models come with a floor which provides more effective insulation against the cold and keeps the crawlers at bay too. The size, the brand and the material are going to play a big part in the final price of your tent or bivy sack. Bottom line? It’s only the type of outdoor experience you’re going for that is going to help you decide which one you need for your trip: a tent or a bivy sack. Bivy sack vs hammock- which one is better? Knowing which sort of shelter you’re going to depend on when out there is one of the skills you need to develop. The comfort of the shelter, the type of the environment in which you’re going to go- they all count when selecting your type of shelter. Bivy sacks and hammocks bring plenty of good things to the table and each of them come with downsides. This time let’s go differently and see the ups and downs for each of them. This way, you’re going to be capable to select the right one for your outdoor experience. Small and designed to accommodate just one person, the bivy sacks are the no.1 option for the minimalists out there. They’re lightweight and compact and have no hard structural elements. They’re really easy to carry and need littler space for storage in your backpack. Even if the hammocks aren’t that heavy, they still contain more elements for structure. They’re really easy to set up and this is amazing especially when the weather gets bad all of the sudden. They’re able to protect you from the elements in a couple of minutes. The hammocks, on the other hand are going to need at least two trees for installation and they may not protect you from the elements. They come with built-in protection from the weather. When it’s raining or snowing, zipping up your bivy sack is going to be enough for protection. If the sun comes out, you may simply open it and enjoy the nice weather. Well, no worries when using the hammock on a lovely weather. If it’s raining, forget about installing your hammock, though. The bivy sacks are highly versatile as you can install them pretty much wherever you need. No matter where your trails is going to take you, you can simply lie down and…get inside your bivy sack. Need to say more about the hammocks? They can get a bit uncomfortable as you set them up right on the ground. Sleeping on rough terrain isn’t going to be very pleasant at times. as long as you get used to the comfort of hammocks, you’re not going to have any problems with rough surface when using one. The heavy rains may collect on the ground and soak through the bottom of your bivy sack. This is going to get you and your bivy sack all wet. When it comes to hammock, no ground- no wet surface. But, yet again, why would you use a hammock when it’s raining? They’re lightweight and rather easy to store in your backpack. Just as the bivy sacks, they’re not going to take a lot of storage space and they’re really easy to travel with. Most of the time, you’re going to set up your hammock between two trees, keeping you off the ground in a pleasant way. If it’s raining, you’re not going to worry about water collecting on the ground (like in the case of bivy sacks). You don’t need to find level ground for installing your hammock. They’re as versatile as bivy sacks, with the slight addition that you need to hang them up somehow. They’re open to the air and the environment so they make a better choice for the claustrophobic customer. Seeing the night sky or the surroundings isn’t going to be a problem when using a hammock. You’re going to have to look for areas with trees when using a hammock. Going in the desert and taking a hammock is never a good combination, for instance. The drying tree branches may pose a risk for the hammock users. You need to run a thorough check up of the trees before setting up your hammock. The same goes for the bivy sack, but the risks aren’t the same. As they’re open, the hammock gives no protection whatsoever against the elements. When you take a hammock with you, you should also pack a tarp for staying dry and protected in your hammock. Therefore, the hammock goes together with a tarp, as opposed to the bivy sack which can work on its own. Long story short, both the bivy sacks and hammocks may work for your trips, but it depends on the environment that you’re going to. It’s quite possible that the bivy sacks win the versatility and the protection against the elements part. On the other hand, if you’re also aiming for enjoying the open air and the surroundings, the hammock is going to take the lead for sure. Bivy sack & tarp – does it make sense? Backpacking light is probably any hiker’s dream and the more you know about camping, the easier is going to be for you to discover which kind of outdoor experience fits you the most. Going lighter in the outdoors isn’t only about the lightweight gear, but also about trying a simpler and less cluttered experience when backpacking. And one of the things you can try is tarp camping. They’re highly versatile and you can set them up in numerous ways. They give an amazing feel of freedom and connect you with the wilderness. Even if your bivy sack is waterproof, you may still want to combine it with a tarp from time to time. You may very well use either of them on their own, but they definitely complete each other, especially on a rainy day. Your bivy sack is going to add 5 to 10 degrees of warmth during the night, protecting you against the elements, whereas the tarp is going to give you the shade you need on a sunny day or a bit more protection when raining. In the end, they’re both lightweight and easy to store so bringing them both on your hiking trip is definitely going to work. Bivy sack vs sleeping bag / Do you need a sleeping bag with a bivy? Both sleeping bag and tent, the bivy sack manages to offer similar performance to a sleeping bag in terms of comfort, but it also manages to keep the elements away from the inside. The bivy sack is a sleeping bag simply because you can sleep in it (when you don’t have the time nor the means to install a tent or you’re forced to stop for the night), but it can very well work as a shelter for the minimalist hiker/climber or skier. It’s truly a bare-bones place to sleep in. The bivy sack is a bit larger than a regular sleeping bag and you should also think of it as an outer shell for your bag that is made with waterproof and breathable fabrics that keep the elements away. When taking a tent doesn’t make any sense, you should only pack your bivy sack as it’s going to serve you as a shelter and a sleeping bag altogether. Due to its light and simple build, the bivy sack is really versatile and you may use it along with a sleeping bag. Most models out there have no insulation and come with a tough waterproof bottom and a waterproof fabric at the top. They come with a hood and a draw string and you can fit in a sleeping mat (but not all models work for that). A good bivy sack has to be both waterproof and breathable at the same time as it’s supposed to protect your sleeping bag from humidity. The breathability is the most challenging feature for the bivy sack and using a down sleeping bag may provide better comfort during your sleep. You don’t know which one to take? There are plenty of models out there for both and you should consider the weather and the environment where you’re going to be hiking. Sometimes a simple and lightweight bivy sack may work, whereas in colder or rainy situation both sleeping bag and bivy sack may not be enough. Winter camping is both challenging and pleasant but you should be up for the tasks it brings. Not only that you need to choose the right equipment, but you also need to have plenty of skills for making it in the winter conditions. No matter if you’re going with a bivy sack or a bivy shelter, you need to make sure that you get one that is entirely waterproof and has pre-taped seams, especially if you’re going to use it on snow. A waterproof breathable top is going to help with the breathability, reducing the risk for condensation (which is going to get your sleeping bag all wet). The vents and zippers are important as they’re going to ease out the in/out access and reduce the internal humidity as well. The mesh panel isn’t going to be essential for a winter bivy sack as there aren’t going to be many insects to bite you throughout the night. If you fancy more space for your hood, you should get a bivy shelter with an interior pole, though. Many bivy sacks out there are going to be able to take the winter camping conditions and compete even with the lightweight tent options for the winter. You may even find models that are made for four-season use. 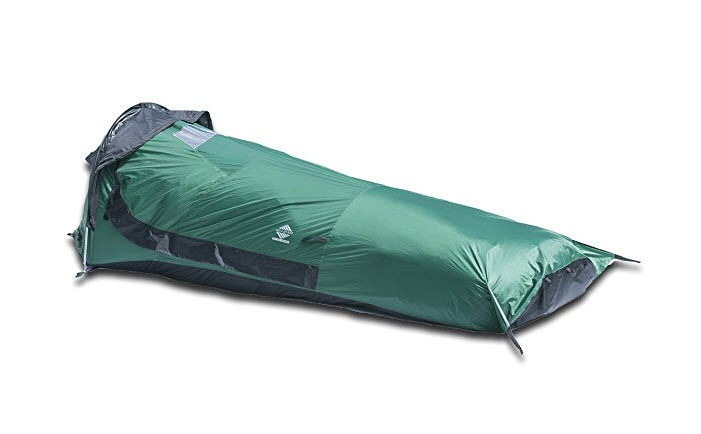 Your sleep system wind proof (most bivy sacks are great on this one as they’re designed to protect you from the elements, the wind including). Can you use the bivouac sack in the rain? Small and lightweight, the bivy sacks definitely evolved over the years and became closeable and breathable sacks that accommodate an entire human body. Some also come with a hoop, which increases the space and improves the ventilation. Even if the type of your outdoor experience is going to count the most when deciding if you’re going to take a bivy sack at all or not, the weather and the environment where you’re going are also essential when choosing. Never mind the weight or the space the bivy sack is presenting/offering. If you’re going to hike for several days on rainy weather, the weight or the space may be the least of your worries when out there. Most bivy sacks out there are both breathable and waterproof at the same time. But waterproofness and breathability don’t exactly work together, so the higher the performance on waterproofness, the higher the chances for condensation due to lower ventilation. Finding the bivy sack that is both waterproof and breathable is quite the challenge, nevertheless. In a nutshell? A bivy sack may work on a light rainy day, but if you know that you’re expecting some heavy rain, maybe you should look for a tarp or even a tent instead. Should you use a bivy sack when hunting? Lightweight and versatile, bivy sacks may work even better than tents as they’re so easy to set up. You may install a bivy sack in places where a tent isn’t (a steep slope, just to give you an example). Your spot only needs to be flat and around 6’x2’. You can sleep in it in a matter of minutes and get out of it a leave just as fast- which may be crucial at times while hunting. Most bivy sacks out there are waterproof so they can work when you’re also using a stove and a floorless shelter. The most important benefit of bivy sacks when hunting is their high mobility, at any given time. If you’re going to be hunting for several days and you’re also expecting some heavy rain or snow, you shouldn’t rely only on the bivy sack. You may pair your bivy sack with a tarp of a floorless tent (travelling light when hunting is ideal). Remember that condensation is a common issue for bivy sacks so air drying it during the day is mandatory. As a hunter, you know that this may send a signal to your game, so make sure you have some plan for covering your smell. Bivy sacks are great for elk hunting as they get you closer to your game (a tent is going to force you hike a lot more). Even though they’re big, elks are capable to move pretty fast too, but they’re more active in the morning and evening. A bivy sack is going to help you camp in no time, get in bed really fast and wake up already for some hunting. Want to become a better hunter? Using a bivy sack is definitely going to help! 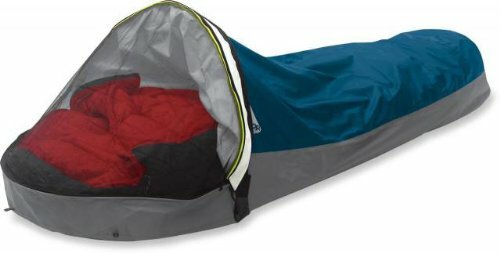 Bivy sack condensation- can you work around it? If your bivy sack isn’t exactly the most breathable model out there, the risk for dealing with condensation inside is pretty high. And no, you shouldn’t just wait or settle with it as it’s one problem that has solutions. It’s the cold nights that raise the risk for condensation inside your bivy sack, especially in cold climates or in areas where the temperatures drop at nighttime by a lot. The dew points and temperature are going to get at the same level during your sleep. In this sort of situation, the moisture is going to collect along the cool areas and inside your shelter (bivy sack including) too. Condensation is going to line the inside of the fabric, leading to unpleasant dampness. As the temperature keeps dropping, the bivy sack loses its warmth, comfort and its overall efficiency too. Your body’s changing temperature may also cause the condensation. Your body is going to heat up during your sleep and you’re going to start sweating. The moisture is going to condensate. Even if it may not be too obvious, it can also worsen the dampness in your bivy sack. Our breath may be the biggest cause of condensation. While you’re exhaling, the air you’re breathing out is a lot warmer than your sack’s material which is cooled by the cold night air at the same time. As time goes by, the moisture from your breath collects inside the bivy sack. This may not happen if you’re hiking in a warmer environment, but only if the environments are humid. When the material of the bivy sack is rather warm and not cool, the risk for collecting dampness is rather low. How to solve the condensation problem? You should try as much as you can not to breath inside your bivy sack. You can, for instance, sleep with your head outside the bivy sack. You’re not going to be able to do it when it’s really cold outside. In this case, you should unzip one small hole near your head as you’re going to help the moisture from your breath escape and not collect inside. the dampness can make the inside and the material really wet, cold, heavy and uncomfortable. The more you wait, the worse the situation is going to get. You should air out the bivy sack any now and then. Unzip it and hang it up every morning so that it can breathe a bit. You may also get a bivy sack made with breathable and well-ventilated fabrics so that you reduce the risk for condensation building up. Wearing fewer layers throughout the night is going to help you sweat less, reducing the risk for condensation as well. You can go with just one warm layers of thermals during the night. In the end, as long as you’re getting yourself a breathable and well-ventilated bivy sack right from the start (sacrificing the waterproofness) and you follow some tips too, you should be able to manage the condensation in your bivy sack most of the time. Bivy sacks and the risk of suffocation! Most bivy sacks out there are breathable so it makes sense that one could easily breath in it throughout the entire night. Sleeping in your bivy sack while zipped all the way may work for a while, but you’re going to increase the risk for condensation. Leaving your bivy sack open (only a little bit is going to work 99% of the times) is going to help with the condensation and with any risk for suffocation. Truth be told, bivy sacks may feel a bit claustrophobic so if you have any problem in that area, you shouldn’t use it in the first place. Some newer models come with bug net windows so that the risk of suffocation is really low. What are the most common bivy sack materials? The diversity of bivy sacks is impressive as bivy sacks serve different purposes. Typically, the bottom and the top of a bivy sack are going to be made from different materials. It kind of makes sense that the fabric on the bottom is tough and waterproof, keeping the sleeping bag dry. You don’t want it to tear or get punctured from the rough surfaces, which is why the material has to be really tough. On the other hand, you’d want the top part of the bivy sack to be lightweight, breathable, waterproof and long lasting. As your body heat and your breath may cause condensation, your sleeping bag may get wet and lessen its insulating ability. You want a bivy sack that is made from a breathable fabric so that you deal with the condensation and moisture issue a lot better. No matter the materials used on your bivy sack, its build also gives for its overall value. The taped seams are going to help with the waterproofing, whereas the multiple zippers and the full-length zipper are going to improve the ventilation and reduce the condensation. A bivy sack that features a hoop and mesh netting gives you more room and helps with the breathability too. However, this sort of features is going to add weight to your bivy sack and being lightweight is one of the reasons for which you may have bought it in the first place. Silnylon- is made from silicone and nylon using a ripstope weave. The silicone is going to provide the strength, whereas the waterproof nylon is used for the bottom of a bivy sack. The ripstop weave is going to reduce the risk for tears from ripping any time soon. It’s not the best choice for bivy sacks, but cheaper models may be made of it. Gore-Tex- is a laminate made from stretched Teflon. Windproof, waterproof and breathable, it’s one solid choice for the bivy sacks. eVent-is able to eliminate the moisture immediately. Breathable, waterproof and washable, this material also offers fire protection and it’s a solid option for bivy sacks. Epic- it’s a combination between silicone and polyester. Windproof, breathable, and water-resistant it works for the top of bivy sacks. It’s only water-resistant and not waterproof. Pertex Quantum- is made with fibers of different thickness. The inside fabric is thicker, soaking in moisture and wicking it to the outer fiber which is thinner. This material is really soft, but it’s also waterproof, breathable and wind resistant. Momentum- is windproof and water-resistant. It’s not the best choice for a bivy sack as its breathability isn’t impressive. Sympatex- is windproof, waterproof and breathable. It uses a wicking technique for the moisture and its waterproofness is also good. Powertex- is a coating that turns a fabric into weatherproof types. It works for the top of a bivy sack. Textrem- is a 100% polyester that has polyurethane coating which makes it both windproof and waterproof. Bottom line is that a bivy sack has to be made with a tough and waterproof material on the bottom and waterproof and breathable material on the top. Silnylon may work best for the bottom of a bivy sack, whereas Gore-Tex, eVent, Sympatex, pertex Quantrum and Powertex are solid choices for the top of a bivy sack. Some of the best models out there are going to have a silnylon bottom and eVent top, but this doesn’t mean that you cannot find other perfectly valid combinations too. One of the main benefits of the bivy sacks (if not the seal dealer for many) it’s the ease of use and setting it up. Slip it over your sleeping bag (it should be a good one). If you’re the meticulous type, you may very well do this step before heading out in the wilderness. You don’t want to do it while in the dark on a raining night, for sure. Pull the bivy sack over your head when you go to sleep. It’s not mandatory, but it can solve a lot of issues if you simply leave a tiny gap for your mouth so that you may breathe better and reduce the risk for condensation as well. Some like to put the sleeping mat on the outside of the bivy sack (it’s up to you). If your bivy sack is on the large size, you may very well place it inside. Don’t forget to put your backpack and any other piece of equipment in a large waterproof bag. Some use them as a pillow- again, it’s a matter of personal taste. A bivy sack isn’t designed to keep you warm per se so remember to get a warm sleeping bag and some warm clothes too. What are the tips for using a bivy sack? If you’re going to use a bivy sack for the very first time, a bunch of tips may give you some help. No matter how great your bivy sack is on paper, some poor decisions may turn the whole experience into a bad one in no time. When you’re selecting your bivy sack, you should give a good though to the environment you’re going to and for how long you’re going to be hiking/camping as well. If breathability counts the most, you shouldn’t have the same expectations in terms of waterproofness. Finding the best bivy sack for your type of outdoor experience is essential. You definitely need to use a sleeping bag with your bivy sack and the type you’re going to use depends as well on where, when and for how long you’re going to go. Don’t use a 4 season down sleeping bag if you’re going to camp in some hot place during the summer time. Staying warm enough in your bivy sack is the key for a good night rest. A warm sleeping mat is going to improve your comfort throughout the night. Not only that is going to provide a softer surface for you to lie on, but it’s also going to ensure a nice insulation from the cold ground. Most of the time, you’re going to lose more heat through the ground (it’s not the same on a windy day, though). No matter how much you trust your camping/hiking equipment, you should always check the weather before going out. No hiking equipment and no bivy sack is going to protect you from the elements when the situation is really bad. Select a flat surface- a flat spot is ideal for a bivy sack. You don’t need it to be big as bivy sacks take only so much space. They may, however, slide a bit so make sure that doesn’t happen. Having a nice view is also one of the things to remember when installing your bivy sack. The freedom that bivy sack gives becomes useless if you’re not able to enjoy the night sky or the sunrise in the morning. Truth be told, the two-men bivy sacks aren’t a common model and you’d rather think about using another type of shelter for you and your partner. You may rely on a two-person bivy tent, if bivy type meets your needs the most. Coming back to the two-person bivy sack, we should mention that you can find models that are made for the emergency use, and not for regular camping. This type of emergency shelter is going to increase your chances of survival when something goes wrong. They’re still made with tough materials and take rain, wind and snow really well. Their construction recommends them for the emergency use as they’re going to keep you dry thanks to the sealed seam edges. A bivy sack for two people is also lightweight and takes little space for storage so you should always pack it when you have the slightest worry about some unexpected events. 4 season Bivy tent – what’s to know? The bivy tents 4 season impress with their highly weather resistance. They’re made with some form of wire/pole as they keep the fabric away from your face. The materials are really strong which explains their durability and the ability to handle heavy-duty use. You can use this type of bivy shelter year-round, but they also work in the winter camping or you need to protect yourself from the elements. They’re not as lightweight as the regular bivy sacks, but they do compensate with the improved comfort, especially when the weather gets bad and the temperatures get really low. Make sure you’re ready to pay the extra buck for this sort of bivy shelter as they can get as pricey as a one-man backpacking tent. Nevertheless, when it comes to weight, a bivy tent 4 season is still going to be lighter and more compact than a regular tent. Emergency bivy sack- why should you get it? If you’re an outdoor enthusiast, you may have discovered by now that having the right gear on you can really make the difference when fighting for your life. When it comes to the emergency bivy sacks, you should have one in your car even if you’re not going to hike any time soon. As its name is quite self-explanatory, the emergency bivy sack is one piece of equipment that can keep you nice and dry when everything goes South. You can find reliable emergency bivy sacks for even $20 so take your time for some shopping. The insulated bivy sack – is this an oxymoron? For anyone who skipped so far, the bivy sack is a portable, waterproof and lightweight shelter and many use it instead of a larger bivy shelter. The bivy sack is great as it’s so easy to set it up and amazing small foot print which allows use in tiny spaces (as opposed to tent-type shelters). The construction of the bivy sack involves a thin waterproof fabric shell that is going to go over your sleeping bag. This way, the bivy sack is going to offer 5 to 10degrees of insulation, creating a protective barrier against the rain and wind chill. The bivy sack is a common option for the climbers/hikers that camp in narrow areas. Can you use a bivy sack inside a tent? The short answer to this one is a definite “yes”. If you feel that your tent and your sleeping bag don’t provide enough protection throughout the night, there is no reason for which you shouldn’t use your bivy sack too. However, that most of outdoor enthusiasts are going to use either one of them so using them altogether doesn’t make sense. If it’s pouring rain and your bivy sack doesn’t handle it, you may perfectly get inside the tent (assuming it’s already set up). Most of good bivy sacks out there are going to keep you warm, adding 5-10 degrees to the temperature inside the bivy, so you should try use it if your tent doesn’t keep you warm enough. Long story short, one can use the bivy sack inside the tent, even though it doesn’t really make sense to rest of us.